The Living Kitchen is the show where real food, food intolerances and preparedness become a sustainable lifestyle. 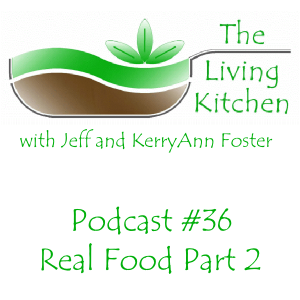 This week on The Living Kitchen, KerryAnn and Jeff discuss more beginning steps to move into a real food lifestyle. This episode covers bone broths, fats and eating local and in season. Click here to sign up for our free Chicken Stock Video Course. You must confirm your subscription by the e-mail you receive in order to view the course contents. You can listen at this link or use the embedded player above. You can download our episodes on iTunes or through our RSS feed. You can also listen to the episode using the embedded player above. You can see all of our episodes on our Podcast page, or you can view all of our past episodes on our show page at the PRN website. If you enjoy the show, please leave a review on iTunes.